The MINI Kitesurf Tour Europe 2013 is the official European kitesurfing championship and a showcase for the most outstanding kitesurfers in the Freestyle and Racing disciplines. The competition comprises four stages, the first of which will be held from 30 May to 2 June 2013 in Almanarre Bay, one of France’s most popular windsurfing and kitesurfing spots. Three other surf spots provide the venues including the German North Sea island of Sylt from 3 to 7 July 2013. The third stage (19-22 September) will be held on the beach at Hoek van Holland – Rotterdam’s city beach – where the extreme athletes will once again pit their waterborne skills. The final event takes place in the Spanish coastal resort of Castelldefels, southwest of Barcelona, from 9 to 13 October 2013. 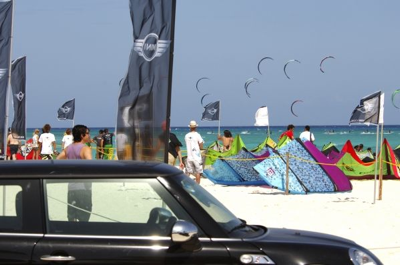 Thanks to its Europe-wide venues and international contestants, the MINI Kitesurf Tour Europe 2013 enjoys worldwide renown. Participants from more than 20 countries compete for top placings and total prize money worth 40,000 euros.